Bahrain Family Leisure Company we know that our people are our greatest assets, we constantly strive to seek out the best in the industry from around the globe. We look for people who have a passion for the industry, who really want a career in hospitality and who can not only work in our brands but help make us stand out in the crowd. If you want a challenging and dynamic role with scope for progression, then BFLC wants to hear from you. Complete the online application form and be sure to attach a copy of your resume with our uploader. Feel free to browse through our available vacancies, and use the online form to apply for specic job. Our Managers maintain standards , run our outlets , motivate, coach and support our team members and ensure the business are well run. 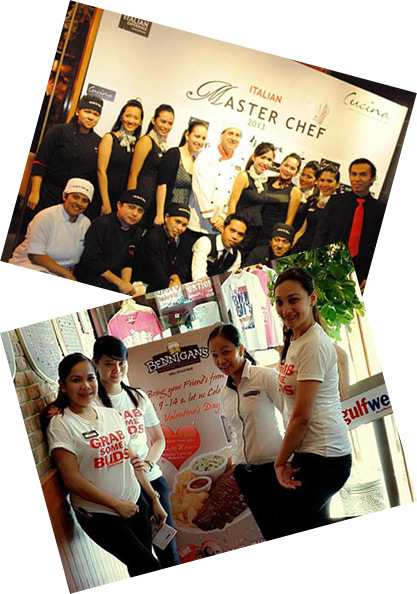 BFLC managers are dedicated individuals who firmly believe in delivering consistent greatness to our guests. Assistant Managers support the restaurant manager in all aspects of the business, they maintain the highest standards, focus on the guest experience and aspire to move up the ladder. BFLC's assistant managers are often restaurant managers in waiting. The Sous Chef manages the back of house team, delivering consistent quality with an eye for exacting standards. Experienced in health and hygiene with a spark of creativity our Sous chefs must be driven, innovative and guest focused. The CDP assists the sous chef in managing the back of house operation, they will help develop our chef teams and ensure the standards never drop. BFLC's CDPs are our future Sous chefs and we expect them to drive their own development , constantly striving to increase their abilities and knowledge. BFLC's supervisors are not merely shift runners, they must wear a great many hats. Trainer, manager, business developer, marketeer and many more. We expect our supervisors to aspire to be more and want them to become full managers within the company through recognised achievement. Our Bartenders tend bar, build relationships with our guests, maintain stock levels and delight with exciting beverages for all. Our front line troops, our waiter/ess's need to be committed to the guest experience, they are not simply order takers but brand ambassadors who we expect to enhance each individuals visit to our restaurants. We are only interested in candidates who know , understand and embrace the concept of hospitality versus mere service. Our chef teams are the heart of the business, like a well oiled machine, the chef's provide food in a timely fashion for our guests – maintaining the highest quality of produce and hungry to develop their skill set. Often forgotten – BFLC's stewards are an integral pin in the machine that makes up any restaurant team, they ensure the kitchen is never without a clean dish, our guest toilets sparkle and health and hygiene standards are always high. Our drivers are both logistical support and waiters all in one, they offer swift delivery to our guests while giving them a service experience you don't find from other restaurants.